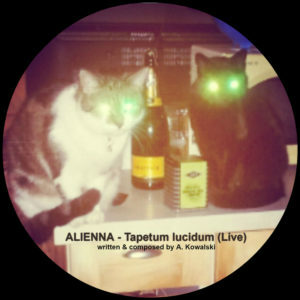 I produced and recorded “Tapetum lucidum” directly playing on 1 machine and the analog heat for adding compression and saturation, while recording i was inspired by KiNK’s short video’s with the leploop, aphex twin, space-time continuum and my (3) cats. The tapetum lucidum /təˈpiːtəm/ (Latin: “bright tapestry; coverlet”, plural tapeta lucida) is a layer of tissue in the eye of many species. It contributes to the superior night vision of some animals. Many of these animals are nocturnal, especially carnivores, while others are deep sea animals. Humans, lack a tapetum lucidum, and compensate for this using perceptive recognition methods.